If you are looking to buy a new car, the next 18 to 20 months will probably be the best time. May's issue of Singapore's leading motoring magazine is useful if you are considering a budget ride. Its group test pits the Mitsubishi Attrage against the Suzuki Ciaz and Mazda 2 sedan. And even if you are looking at something more premium, check out two twin tests: one comparing the Jaguar XF 2.5t and BMW 528i, and the other comparing the Lexus IS200T F Sport and the Infiniti Q50 Sport. Hunting for an MPV? Read about the BMW 216d Gran Tourer. How about the new Mini Convertible - May's cover car - if you want something more playful? 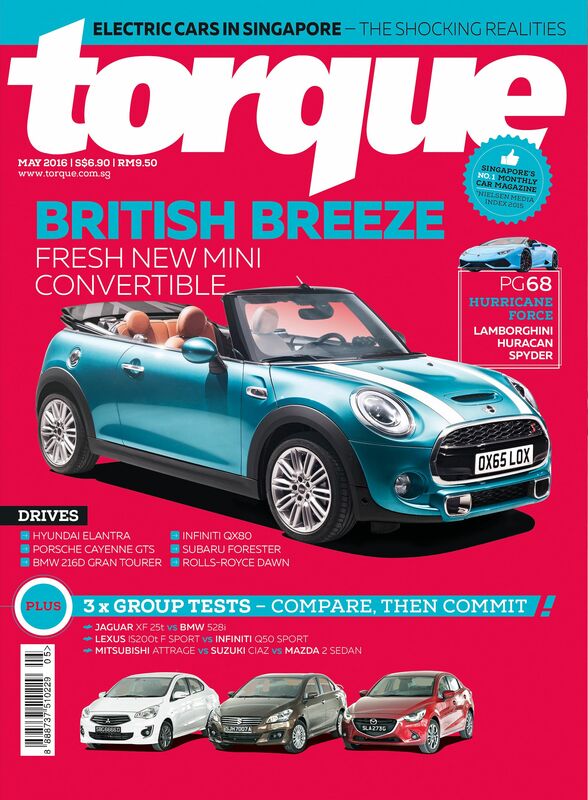 Torque is out at newsstands.